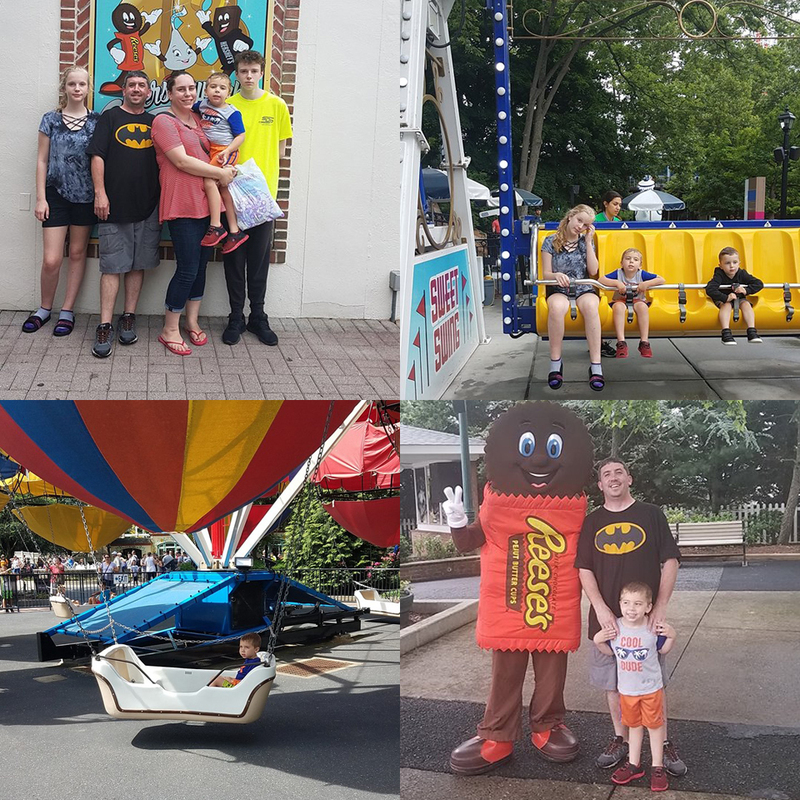 We recently took the family on a trip to Hershey Park. This is one of our favorite family vacations and perfect for everyone in our family. 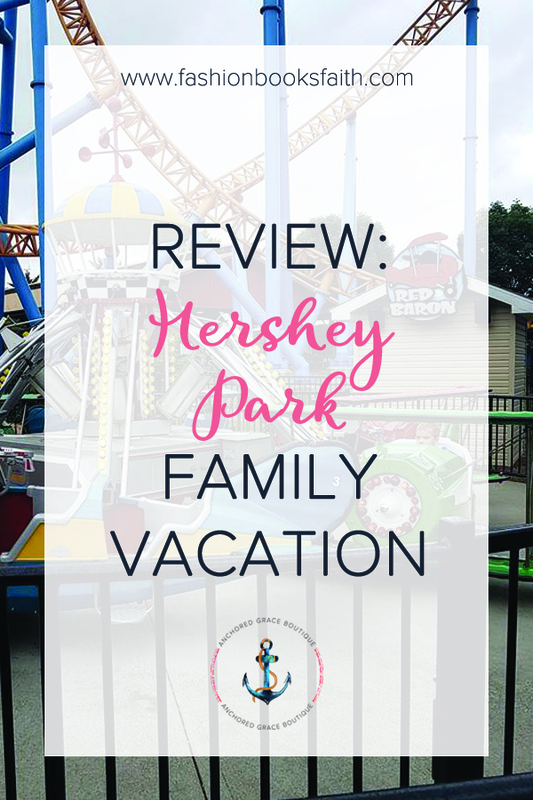 Read on to hear more about our Hershey Park family vacation. First things first, Hershey Park is a big park and I would highly recommend you go for at least two days. We’ve done one day in the park before and it’s just not enough time to enjoy yourself. We traveled down the night before our planned park time. We stayed at the Comfort Suites in Grantville. The hotel was about a 15-minute drive to the park. The hotel was very reasonably priced – we had a room with two full beds and a pullout sofa. It was a bit hard on us since the kids are getting too big to share a bed with us. I’d recommend if you are traveling with five people to look at a hotel with bigger rooms. Otherwise, this hotel is perfect for your Hershey Park family vacation. We headed to the park to be at the gate at opening time. This is a big mistake, it took so long to get in the gates. The second day we started out about 30 minutes later and still ended up in the park at the same time. Take a look at where the trolley stop is and park near it. The trolley is free and runs all day from the parking lot and saves you a lot of walking. This is important when you know the park is going to tire the kids out anyways. Our first stop in the park was the stroller rental – Mason is still too young to do all of that walking. Near the front of the park, you’ll find some of the kiddie rides. Mason hit up a few of them before we split the family up. We’re lucky in that Sean doesn’t ride roller coasters so he took Mason and Caroline off. Noah and I went for the thrill rides. Let me just throw this out there, I actually hate roller coasters. But I love them too. Noah and I went to the Skyrush. This ride was amazing. It was fast, like 75 mph. And that first drop was amazing. From there we hit up a few of the other coasters. Great bear and superdooperlooper are both near Skyrush so you can hit them all in quick succession. Next, we met back up with the others – we hit a few more kiddie rides. And then had lunch. I’ll cover food and drink in the next section. After lunch, we hit up the water park. The water park at Hershey is huge – Sean and Mason went to the kiddie section and the rest of us hit up a few of the slides. We met up and took a lap of the lazy river. Little kids can’t go on the lazy river in their own so they will need to ride with you. That was kind of hard with Mason, he’s at the edge of being too big to ride with me. After the water park, we headed back to the hotel. The kids were all exhausted and ready for bed. The food in the park is typical park food. I will recommend if you’re going to eat at the park, plan on buying the meal package. It’s well worth it – you can eat every 90 minutes. We just bought food once in the park. We bought each of us a meal which turned out to be way too much because no one was that hungry. Try splitting meals to save. I would recommend grabbing the drink cup – it was around $15 but you could refill it every 10 minutes all day long. It also includes icees. We refilled that cup a lot on the hot day we were there. The second day in the park, of our Hershey Park family vacation, it was rainy. The day started out drizzling and overcast. We quickly hit a few of the roller coasters that we hadn’t done the day before. I highly recommend, if you love roller coasters, hit as many of them as you can. Stormrunner and Fahrenheit were both amazing, terrifying, exhilarating rides. If you like coasters, these are must rides. We took the time to take Mason on some more of the kiddie rides. Caroline also got a chance to go on two roller coasters. Wild Mouse and Trailblazer are both roller coasters that are suitable for children who aren’t quite ready for the big roller coasters. There are so many good rides, I can’t even name them all. You can definitely see why two days in the park are needed. And, we didn’t even get to hit every ride. After we grabbed some souvenirs and headed out of the park, we had to stop at the Chocolate Factory. The chocolate factory is right near the trolley pickup so not too hard to hop on. Kids will love the factory tour – the line is a bit long but the kids were so excited that we had to do it. You get to ride in a fun little car and it takes you through and shows you how the chocolate is made. After the tour, there are tons of different candies and souvenirs you can grab. We loved Hershey Park and Mason regularly asks if we can go back again someday. This park is fun in every way – there are chocolate characters wandering around. I can’t wait for our next Hershey Park family vacation. Have questions about Hershey Park? Want to send us to your park for a review? Drop me a message or head over to our group and discuss there.